There are many chances for the Earth to perish in the far off years to come. Long, long after we've all passed our expiration dates, buildings will decay, a global disaster will wreck Earth, men will go extinct, the Sun will evolve into a red giant, and the Earth will die. BBC Future has created a timeline of possible events from one thousand years from now to one hundred quintillion years from now. BBC called the infographic its "most ambitious set of predictions yet," drawing research from NASA, Potsdam Institute for Climate Impact Research, and many others. A windy timeline labels each event as it pertains to the Earth, humanity, and "the heavens," or space. Marked with a circle, the size of the circle indicates the magnitude of the event with larger circles having a higher impact. The timeline begins with predicts of what will happen 1,000 years from now. BBC anticipates most words will have gone extinct by this time "due to the rapid evolution of languages." Similarly, around this time all builds will have decayed if civilization by this point has collapsed. Carbon dioxide will be sticking around for a while; 29% of carbon dioxide released before 2100 will still be around in 3000. In another thousand years, the Greenland ice will have melted due to extreme global warning, causing seas levels to raise six meters higher. In one billion years, there isn't going to be much of anything on the planet that's stuck around thanks to the Sun causing the Earth's surface temperature to rise to 47 degrees Celsius (116 degrees Fahrenheit), meaning oceans will evaporate and creating an atmosphere akin to a moist greenhouse. Life will completely die out later when the surface temperature reaches 147 degrees Celsius (297 degrees Fahrenheit). But life will go on elsewhere. The sun will exhaust its hydrogen and begin to evolve into a red giant five billion years from now, becoming a black dwarf and invisible to human eyes (if they still existed) in the next nine billion years. By 20 billion years, it's entirely possible that the universe ends as all matter is torn apart by the universe's expansion making all distances infinite. If by some stroke of luck for the Earth and it has not been consumed by the Sun at 5.4 billion years, the Earth's orbit will throw itself into the sun in one hundred quintillion years. 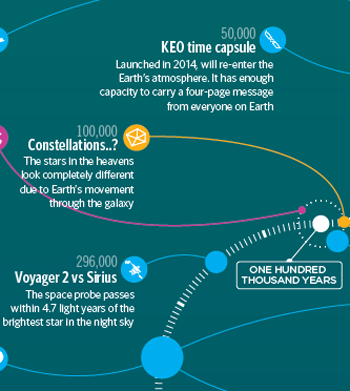 There's a lot of other possible happenings to the universe listed in the BBC's timeline; check out the whole infographic at BBC.